True Detective is an American television anthology drama series on HBO created and written by Nic Pizzolatto, with the first season directed by Cary Joji Fukunaga. 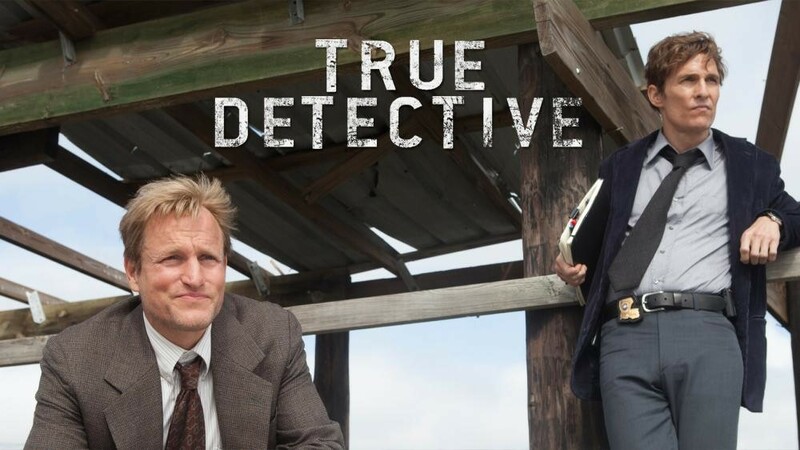 Season one stars Matthew McConaughey, Woody Harrelson, Michelle Monaghan, Michael Potts, and Tory Kittles, and utilizes multiple timelines to trace two Louisiana State Police Criminal Investigations Division homicide detectives' hunt for a serial killer in Louisiana across seventeen years. Crap, I heard about this show today and made a mental note to watch it, but I didn't realize it was on HBO. It's the only good show on right now. Easily the best intro. one of the best shows in many years. im sad theres only 3 episodes left, but im sure theres plenty of rabbit hole to dive into before it ends. "All authority of any kind, especially in the field of thought and understanding, is destructive and evil. Leaders destroy the followers and the followers destroy the leaders. You have to be your own teacher and your own disciple. You have to question everything that man has accepted as valuable, as necessary." Can't stop thinking about this damn show! Started watching it about 20 minutes ago. Been laughing at the banter between McConaughey and Harrelson, it's just too funny. When did McConaughey get to be a good actor anyway? I wasn't much impressed with him years ago, then I saw him in Killer Joe a few years ago and was blown away. He really stepped up his game. I'm a big fan of Michelle Monaghan, and even Kevin Dunn is in this. Cool. Haven't you heard? It's called "the McConaissance". Yes, it's actually a thing. But yes, he is amazing in TD. I think it's the most truly comprehensive performance I've seen him give (although I haven't seen Dallas Buyers Club yet). Woody is pretty great too. I rather like the show so far. I do yearn for a bit more plot focus, though. I kept looking at him in the opening clip of the current time sequence ("OMG? Is that really him?") Yeah, it was. He really seems to be inhabiting someone else's skin. The earlier timeline, he looks a lot more like I know him to be. Fictional detectives & MBTI types? Which is the True Opposite? How do you decide what you call "True"?